Popular usage of the term “renewable energy” is problematic, because it includes two distinct classes or sub-categories of energy sources: On the one hand, forms of bioenergy that serve as fuels for vehicles, feedstock for power plants (i.e., biomass, biofuels, etc. 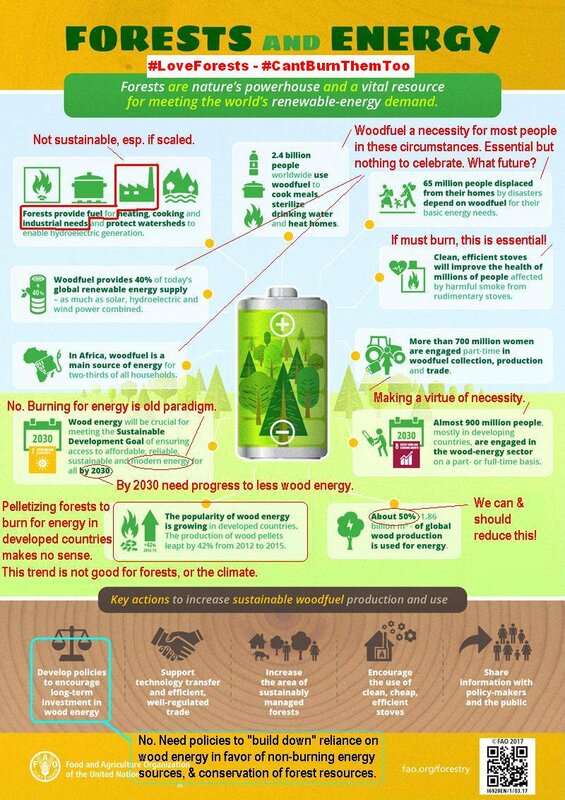 ), and all the way down to firewood for cookstoves; and on the other hand, a set of technologies that in effect harvest energy in nature (solar, wind, wave, hydro, and geothermal, along with smaller scale energy “scavenging”). The common opposition of renewable energy vs. fossil fuels obscures this important distinction. The various forms of biomass and biofuels that are generally considered as renewables are burned – or combusted – to release energy (along with pollutants and carbon dioxide), just as are the fossil fuels they are intended to replace. It is important to point this out at a time when headlines tell us that various countries are marking new “firsts” in replacing fossil fuels with renewables – e.g., Costa Rica, Portugal, and Britain. It is also essential to be clear on this as we plan our energy future. It would be more productive, however, to think of the two broad categories of renewables and energy from burning as partially overlapping categories or sets. This can be illustrated in a Venn diagram, with biomass, biofuels, etc. in the overlap (brown region). 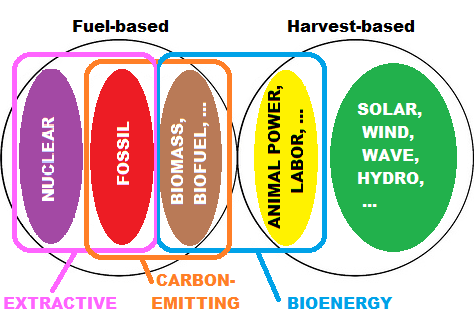 This portrayal highlights the unique position of these forms of bioenergy. It also raises the question as to whether we really should be talking about three categories of energy rather than two. I will come back to that but first will expand the context. In considering bioenergy in a broad sense, it seemed useful to account for a batch of relatively smaller inputs into the overall energy system that do not involve conversion of living matter to fuel or burning it: animal draft power (which was centrally important in the pre-industrial age, but only locally important in some regions today); human physical labor (never insignificant, even given the integration of the 20th century cohort of automation technologies into the economy); and harnessing microbial processes (from age-old use of micro-organisms for fermenting foods and beverages,² to newer technologies like industrial microbiology, biomining, and microbial fuel cells). However, I am proposing to adding a twist in that the work of “organisms” (so as to put these diverse sources under one heading) is not treated as conversion of caloric sources (food as “fuel”),³ but is rather seen as a utilization of their energy and effort, which would have been otherwise expended had it not been harnessed or employed to accomplish some defined work. The difference here is that a machine doesn’t need energy to exist (once created), but then it cannot do anything without a source of energy. Organisms on the other hand exist (continue to live) because they are already consuming calories, and may be engaged in work from that state (although greater effort will require them to consume more to sustain the increase in activity). I’ve tentatively added these as a subset of renewables in the following diagram (the yellow circle). 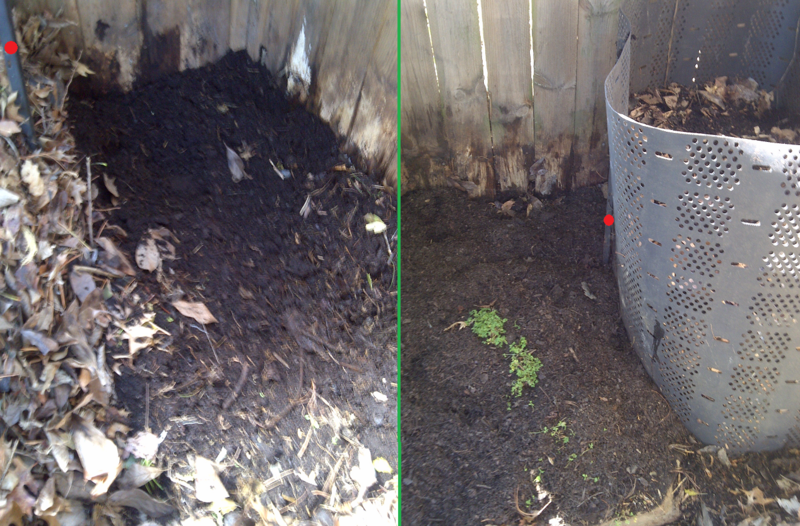 One from plant matter (to include algae) burned as fuel, directly or after conversion into a more convenient form. This is the main or exclusive meaning used in most discussions of bioenergy, and it is the one I am contending should be thought of as being at the same time both renewable and burnable/combustible. In the following diagram, the components of the preceding diagram are rotated and separated, to show five (5) categories of sources of energy (rather than three). These are of unequal importance, but the relative size of the elements in the diagram has no special significance. Having disaggregated these categories, we can organize them by other criteria. 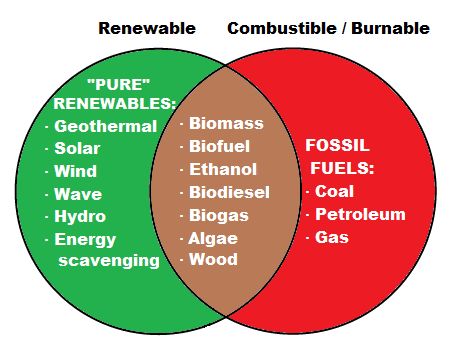 In the following diagram I regroup the above categories in several ways without relying on the two main categories or sets discussed above “renewable” and “burnable”). The fundamental difference that emerges from this collection seems to be that between fuel-based (converting some kind of fuel into energy; this term is not new, though it is usually seen prefixed with “fossil”), and harvest-based (harnessing or employing energy not bound up in a fuel; this term, which is rare in this context, is not to be confused with the agricultural harvest of crops which may be converted into a biofuel or biodiesel). 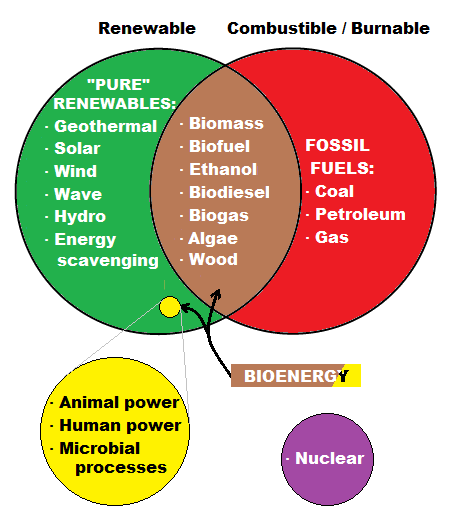 Nuclear, fossil, and the biomass, biofuels group are fuel-based. Except for nuclear power, these are also carbon-emitting. The use of nuclear fuel, of course, has its own waste issues. Fossil fuels and nuclear material are extracted resources, which like other extractive industries have various economic and environmental implications. The fuel-based bioenergy sources include major use of land/soil and water resources – as well as energy – to produce plants for biomass or biofuels production. 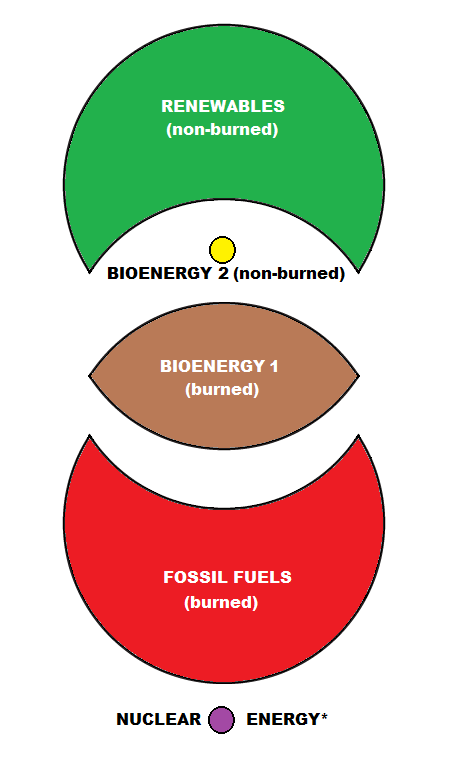 The broad class of bioenergy, as discussed in the previous section, bridges the fuel-based/harvest-based categories. By far the main harvest-based energy sources, however, are solar, wind, hydro, wave, and geothermal. Our usual distinction between “fossil” and “renewable” – and even my alternative of overlapping “burnable” and “renewable” – might appropriately and productively be replaced with this “fuel-based” and “harvest-based” distinction. Fuel-based systems in general seem to have a different set of constraints and possibilities than harvest-based, and to involve a different kind of infrastructure investment and commitment. Their cycles of use involve: extraction or production; refinement or conversion into fuel form; storage and distribution; machines to convert fuel to energy (which may be mechanical energy as in an internal combustion engine or the generation of electricity); and finally waste. 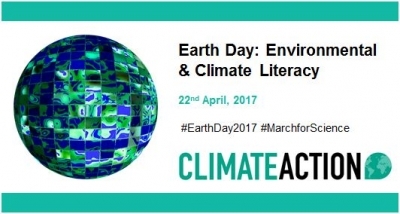 There is also the demonstrated potential for environmental damage throughout the entire cycle of use of fuel-based energy sources – some systemic (such as ongoing carbon dioxide pollution) and some due to the possibility of error, accident, or natural disaster creating catastrophic scenarios. Harvest-based systems (leaving aside the bioenergy subset of animal power, etc.) also involve various types of machines and infrastructure, but almost all these days produce electricity. With the exception of dams connected with hydropower, these energy sources do not carry the systemic or potentially catastrophic potential of fuel-based systems. The complexity and potential externalities after the point of harvest (solar panel, wind turbine) are much less than in fuel-based systems. Fuel-based systems are not without advantages, and harvest-based ones do have down sides. But the emergence of increasingly efficient and cost-effective forms of harvest-based energy generation (and the storage technologies used in tandem with them) would seem to have the long-term upper hand. Solar cells and wind-turbines almost literally pull energy out of thin air – so what if rates vary with the hour or the weather? Fuel-based bioenergy vs. harvest-based renewables? Fuel-based bioenergy – outside of the interesting potential to turn waste into energy sources – would occupy increasing amounts of our agricultural potential in order to produce the biomass needed to replace fossil fuels. And it probably will also involve increased genetic tinkering along the way (it’s already being tried with trees). That’s an increasingly convoluted and costly game plan to keep fuel-based systems in play – systems that still put carbon dioxide into the atmosphere even if that is considered to be offset. All this seems hidden in the folds of the renewable energy vs fossil fuel dichotomy. Harvest-based renewables (solar, wind, etc.) may not be a cure-all – the “future of energy” may indeed need a complex of sources. However, the implications of harvest-based approaches for infrastructure and a whole range of transportation and industrial technologies are different than those of fuel based, and at a certain point sooner or later, the decision will have to be made regarding shifting the dominant paradigm away from fuel-based energy of any sort. 1. Substitution depends on the context. Broadly speaking, one can say that all energy forms are substitutable given the means to convert the energy source to a particular use. The sense intended here is narrower: ethanol can be used instead of gasoline, partially or completely (though in the latter case some re-engineering might be needed), to run a car; and wood pellets can be substituted for coal to fire electricity generation (though some retrofitting of the systems may be necessary). But electric powered vehicles have a different kind of motor altogether; and solar or wind generation of electricity are different processes than that in a fossil-fuel or biomass fired energy plant. 2. The complex process of converting corn into ethanol actually uses this form of bioenergy (work of yeast for fermentation) to create the other form of bioenergy (a fuel that can be burned). 3. 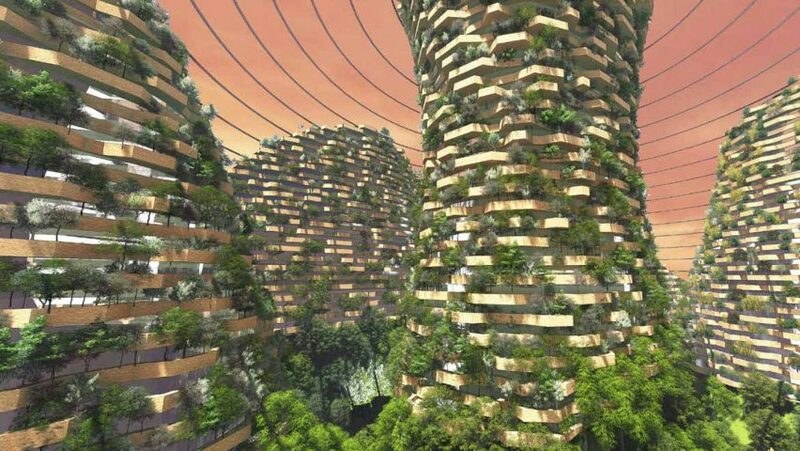 For example, Adam J. Liska and Casey D. Heier frame bioenergy in this context this way: “For more than 10,000 years, the foundation of society has been bioenergy in the form of grass, crops, and trees for food for humans and other animals, as well as being a source of heat.” (2013, “The limits to complexity: A thermodynamic history of bioenergy,” Biofuels, Bioprod. Bioref, 7: 573-581.) I am departing from this apparently standard definition, distinguishing between food and feed “burned” as calories on the one hand, and vegetative matter literally burned (in whatever form) on the other hand. And in the former case, I shift the focus to the organisms whose effort (however fueled) is being used.